It remains the third deadliest shipwreck ever in New Zealand waters: 121 lives were lost when the steamer Wairarapa struck Miners Head, on the northern tip of Great Barrier Island, 90 km north-east of Auckland. Despite thick fog, the Wairarapa was travelling at 13 knots (24 kph), nearly full speed, when it slammed against the cliffs of the island. Water began to flood in through a hole in the hull, and the Wairarapa listed to one side. 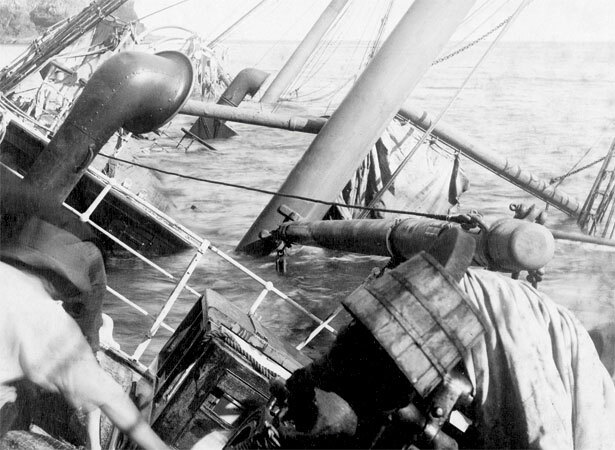 Many of those on board slid off the deck into the sea; heavy seas swept others away. Those left on board clung to the rigging or climbed to the bridge. A steward swam ashore with a line along which passengers hauled themselves through the water. Survivors huddled on the rocks for more than 30 hours before local Māori rescued them. A resulting Court of Enquiry laid the blame on the Wairarapa’s captain, J.S. McIntosh. As well as maintaining excessive speed, he had taken the wrong course from the Three Kings Islands and not made allowance for currents. We have 8 articles, related to SS Wairarapa wrecked on Great Barrier Island.